Monday Mischief and Rubbish Mum! We are apologising on behalf of Mum, who is really falling behind on everyone's blogs, she has been really busy the past week and she hasn't even had chance to write about her crufts adventure yet. She is rather rubbish if you ask us, BOL! She said that she will try to get to everyone's blogs in the next couple of days, in the mean time we hope everyone has a great week! We hope you all had a great weekend and have lots of fun adventures planned for the week ahead. Mum had a very busy weekend, yesterday she went to Crufts where she saw lots of doggies, bought tonnes of nice things and even met up with Leigh! Then today Sampson and her went and did a charity dog walk for the local hospice. She will write about her adventures in her next post. 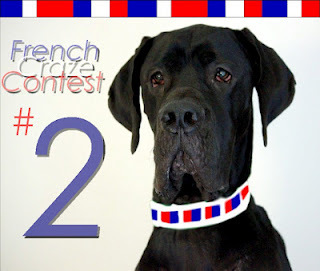 Now our bloggy friend Lincoln the Great Dane is holding a French Craze Competition! You have to pick out a French word from the list he has given (or find one yourself!) then find out the meaning and take a picture that relates to it. then put that word on the picture. Simple! 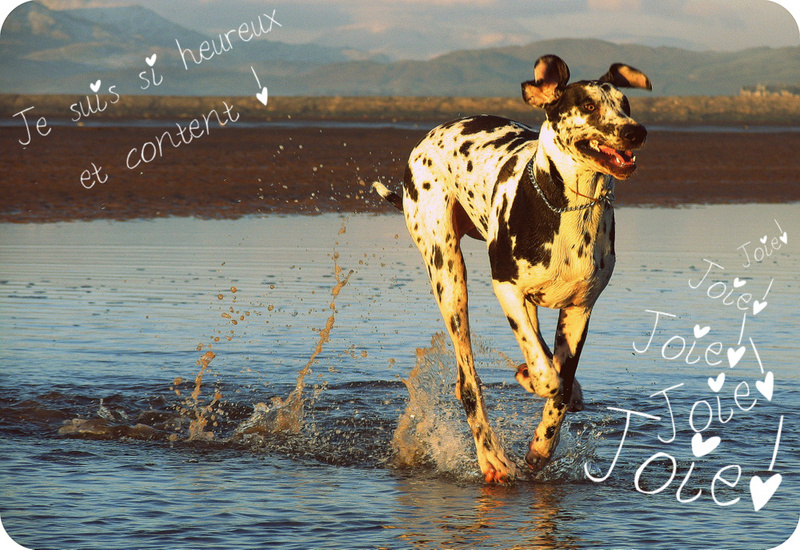 Hope the caption has translated correctly, Mum isn't very good a French! Anyway she had lots of fun doing this and there is still time to enter as the deadline isn't until the 25th. Dante update and Random Bits and Bobs. We hope you all had a great weekend and are looking forward to the week ahead. First off a big slobbery thanks to everyone who wished Dante well, he is on anti inflammatory tablets and pain killers and is getting a small walk each day now. Unfortunately his X-Rays were rescheduled for the end of the week, so we have to wait to find out what the route of his pain is! Poor lad. 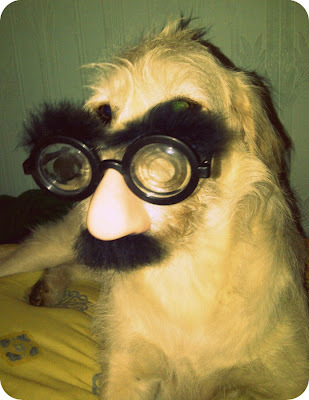 He seems very happy though, probably because of all the attention is getting, maybe he is putting it on, BOL! We will keep everyone updated. Now a very belated thank you to Basset Momma for giving us an award, go visit her blog it always makes us laugh! 2.Link back to the blogger who gave us the award. 3.Pick our five favorite blogs with less than 200 followers and leave a comment on there blog to let them know they have received the award. 4.Hope that the five blogs chosen will keep spreading the love and pass it on to five more blogs. This time Mum started with some sweet potatoes, some left over raw pork chops and veggies, a big pack of beef mince and some pig skin. Yum, yum! It's Sampson's job to be quality control for this whole procedure, 'Yup, it smells good to go Mum'. Then add the meat (the part Mum hates!) Again with Sampson as quality control! Or out! It matches with my jacket perfectly...no? I'm no fashion expert but I think I can definitely woo some ladies in this get up! BOL!